Attention, Message, Leads, and Branding all in one powerful package. The booth staff is processing leads and in the background, your ears detect a balanced sales pitch between a professional product representative and a good-humored entertainer. Gathered are perspective clients fixated on the hands of the visual artist Dale Obrochta. Twirling and twisting, a red air filled tube transforms into customized art and you hear four major selling points being addressed. Your prospects will learn about your global distribution, worldwide organization or why you’re the “best in the world” in your industry. The unique giveaway attracts perspective clients and vendors from across the exhibit floor. Business cards are being exchanged, badges swiped, and competing vendors willingly send traffic to your booth in exchange for their own customized artwork. Leaving your booth is an army of fans who proudly strut around the exhibit hall showing off custom art and talking about your company.Attention, Message, and Leads are easy to obtain when you have the right craftsman Branding an image on your behalf. 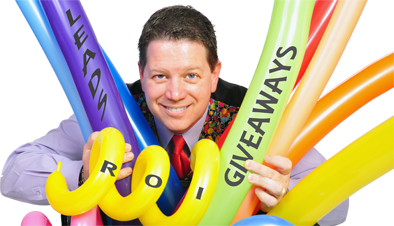 Welcome to the corporate entertainment of Dale Obrochta, better known as Magical Balloon-dude Dale. Clients refer to Dale as "Fantastic, Exciting, Absolutely Wonderful, Hit of the Party, Exceeded my Expectations, Professional, Totally Fun"
Magical Balloon-dude Dale tubular art has been seen at Harrah's & Horseshoe Casino, Chicago White Sox, Chicago Bulls, at private events for Urschel Laboratories, Microsoft, UCAN Chicago, Peddinghaus Corporation, Optimus, Professional Research Consultants. Education Institution of Monmouth College, DePaul University, KinderCare Learning Centers, and numerous Schools and Public Libraries. Making scheduling effortless and allowing the client to focus on other parts of the event, all while proving a great show is what Dale delivers. Solve your entertainment needs like hundreds of other clients by calling Dale. Its the right solution.